We welcome our new client, Rosie Motene. 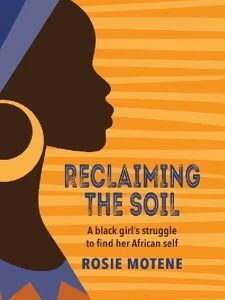 Her book/memoir ‘Reclaiming the Soil: A Black Girl’s Struggle to Find Her African Self’ is now available on Amazon, Kobo, iBooks and Barnes & Noble. We converted the book into an ebook and distributed to these stores. The Rosie Motene story is about a young girl born to the Bafokeng nation during the apartheid era in South Africa. At the time, Rosie’s mother worked for a white Jewish family in Johannesburg who offered to raise the child as one of their own. This generous gesture by the family created many opportunities for Rosie but also a trail of sacrifices for her parents. As she grew, Rosie struggled to and her true identity. She had access to the best of everything but as a black girl she floundered without her own culture or language. This book describes Rosie’s journey through her fog of alienation to the belated dawning of her self-discovery as an African.